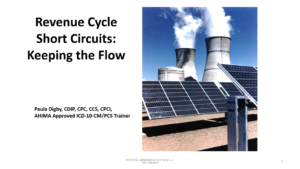 Like electricity, we often don’t concern ourselves with the Revenue Cycle until there’s a break in the flow – such as a short or interruption. In this session we examine the overall Revenue Cycle and the strategic importance of correct documentation, coding and billing. Be able to identify “at risk” documentation behaviors and describe consequences. Describe how defensive as well as offensive coding could be problematic. Identify how documentation and diagnosis coding not only impacts payment but could cause risk of reduction in physician scores and patient confidence. Recognize process inefficiencies that can cause lost revenue and put the practice at risk and reduce patient satisfaction. Understand the relationship between appropriate coding, documentation and follow up protocols. Learn how your EMR may be able to help you.